Enjoy these articles by Charles (Woody) Woods, a Seymour Lake resident. Common Loons on Seymour Lake are one of the great pleasures we all share. Loons arrive early in the spring, usually just after large areas of open water appear. They continue to reside on Seymour well into the fall, sometimes up until close to when the lake begins to freeze in early December. Their winter venue is the ocean on which they sit until spring when they return here and other lakes in New England. Day and night we are aware of their presence. They are our call of the wild, “The Spirit of Northern Waters” to Native Americans. In recent years they have commonly nested in the cove near the outlet. The sight of a pair of loons with two fluffy young chicks is one that most of us have seen, and the topic of many a great photograph. We have all come to take the presence of loons on Seymour as a sure thing, but it has not always been so. As recently as 1983, when loons began to be regularly counted in the state, only 29 loons were counted state wide, and there were only 8 breeding pairs. Many long-time Seymour residents, who remember back 30 years or so, do not remember loons on Seymour. Their “recovery” is one of the great conservation stories in Vermont and all of New England. Today we can be confident that loons will nest on Seymour, and state wide in 2014 there were 301 adults and 66 chicks reported during the July LoonWatch. But a successful nesting is not always insured. Many things can go wrong. In recent years volunteers have insured that there is a safe nesting platform floating in the cove near Camp Winape, and that it is covered with vegetation and surrounded with attractive protective signs. This protects nesting loons and newly hatched chicks from high water, predators and intruders. Not long ago nests on the shore were often flooded out by rising lake levels, or exposed to predation from raccoons. But even this special program of safe floating nest platforms and warning signs does not insure success. In an average year as many as 25 percent of nests will not be successful, or hatched chicks will be lost to predators such as bald eagles, large fish or intruder loons. Or as was the case on Seymour in 2014, the parents just never completed the incubation period and abandoned the nest. It is even possible to love loons too much, as when kayaks or canoes move too close to nests and can cause nest abandonment. 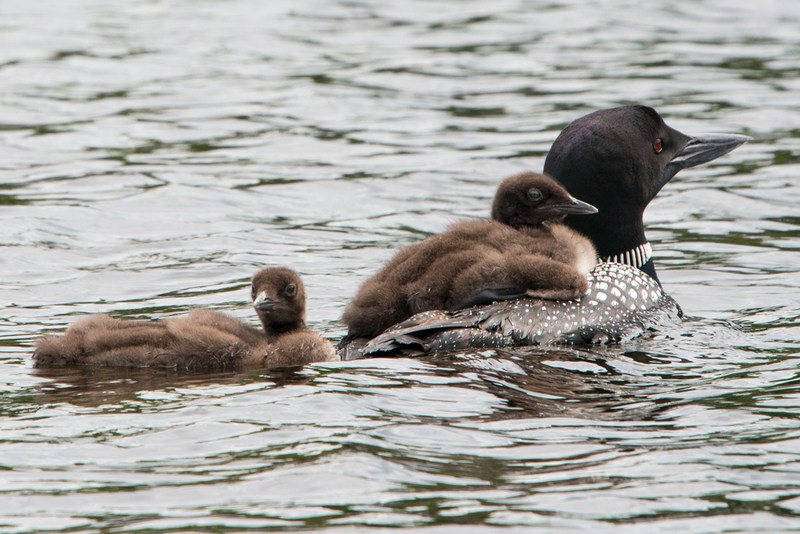 Water skiers and fast boats and jet skis getting too close to where loons are nesting or floating with their young chicks can also cause loss of young chicks. Loons incubate their eggs for 27-30 days. Young loons leave their nest on the first day after hatching and often float close to the adults (which are hard to tell apart). They are not able to fly until they are 11 weeks old (on Seymour Lake that would be early October). Seymour Lake loons are watched over carefully by a number of volunteers, and each year in July there is a state wide Loon Watch. That event takes place on the third Saturday in July each year (July 16, 2015). The results for Seymour Lake are usually discussed at the annual meeting of the Seymour Lake Association. In 2014 there were 7 adult loons counted (no chicks). In 2013 there were 10 adult loons (no chicks). In 2012 there were 9 adult loons and 2 chicks. So the story of loons is not without concern. We have not had a successful chick event in two years, and we are all looking forward to 2015 with guarded optimism.